Catalunya comes to Hong Kong! 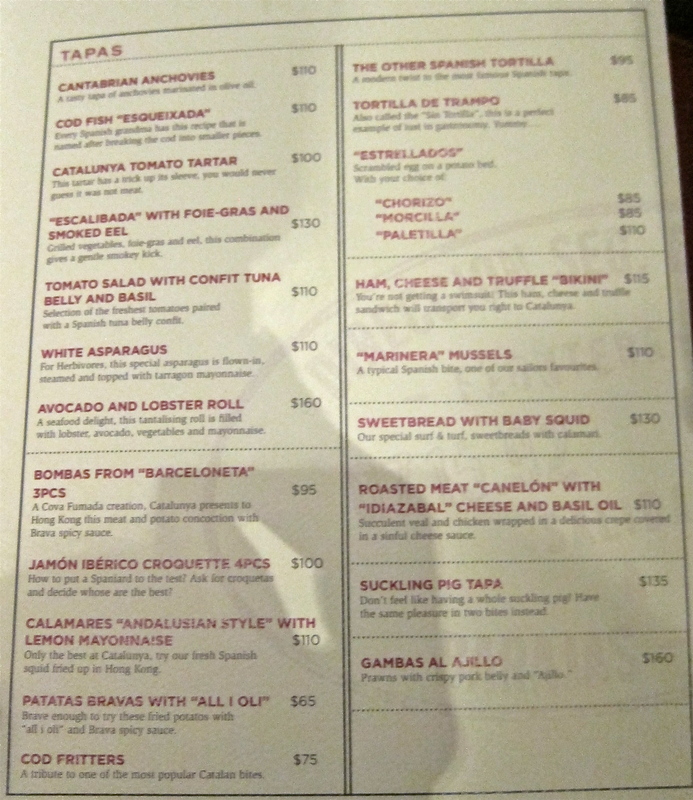 Thanks to our friends AB and VZ, we managed to get a table at Catalunya last weekend, Hong Kong’s newest Spanish restaurant. 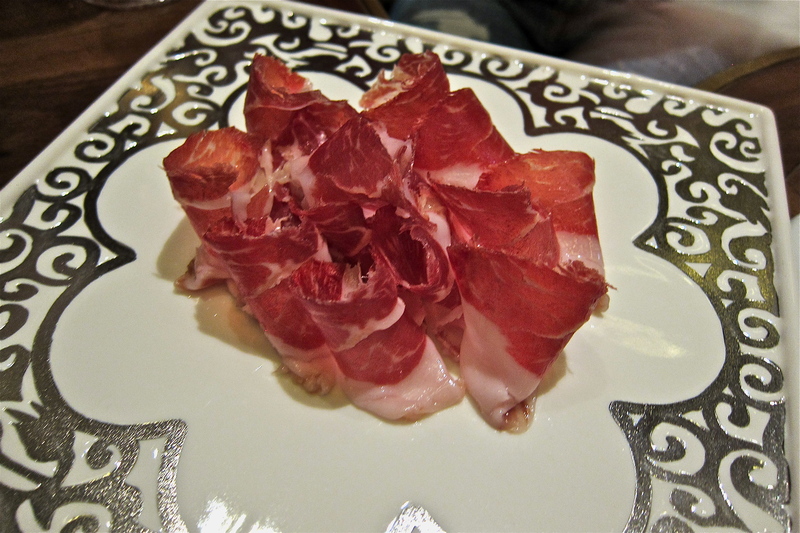 Until now, we have had a few Spanish restaurants to choose from (Fofo By El Willi being my personal favorite), but I must say, none as classy as Catalunya. 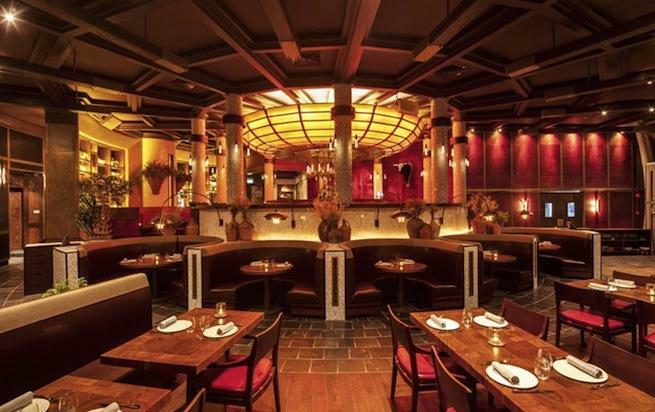 Earthy and sensual tones, plush banquets, wood paneled ceilings, warm red walls and a stunning central lighting fixture: there’s only one word for it, and that is sumptuous. The choice of location is a strange one, off the Wan Chai Road, on a street that houses an office building, a Baptist Church, Queen Elizabeth Stadium, a hospital. In other words, after a certain time of day, the only activity on this road comes from Catalunya, and the flashing lights of ambulances as they pass the restaurant. Nonetheless, the restaurant was packed, and we were seated in the Cocktail Lounge for a short while to wait for our table. Not to worry at all, we kept ourselves busy with sangria, cava, and something to whet our appetites. The word has already been spread that Catalunya’s Executive Chef Alain Devahive Tolosa honed his skills for 1o years at El Bulli with Ferran Adria, a molecular master of creative and thought-provoking cuisine, which I sadly never got to try. 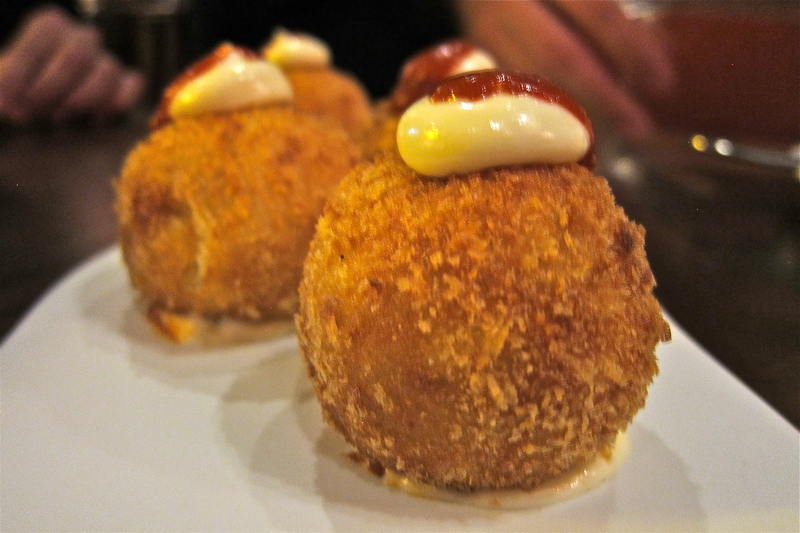 But Catalunya is very different, it’s warm, comforting, indulgent, and introduces you to tapas that are different from the run-of-the-mill. 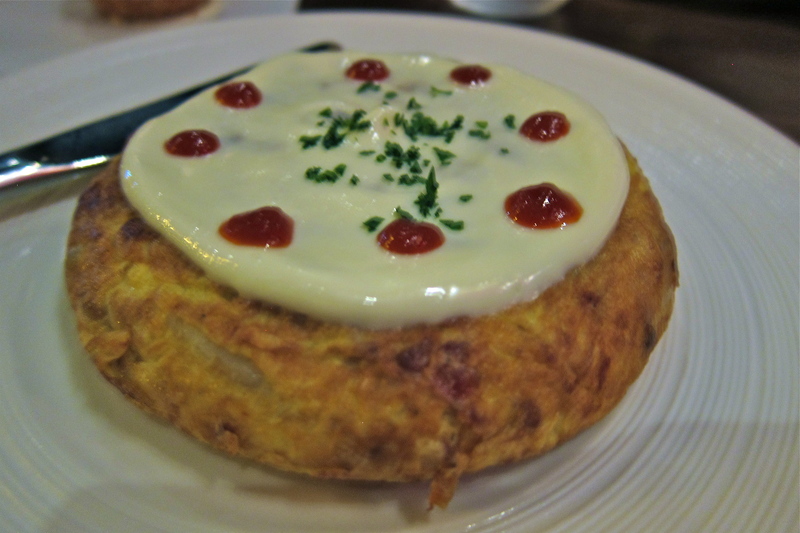 Here they serve a cross-section of Catalan favorites – a tortilla is not just a tortilla, and bikini is not a bikini. We started off with the only molecular item on the menu, a ‘spherical olive’, created by the process of ‘inverse spherification’. Olives are pressed for their juice, mixed with calcium chlorate, then submerged in sodium alginate (!! ), which causes the outer layer of olive juice to harden, but not all the way through. 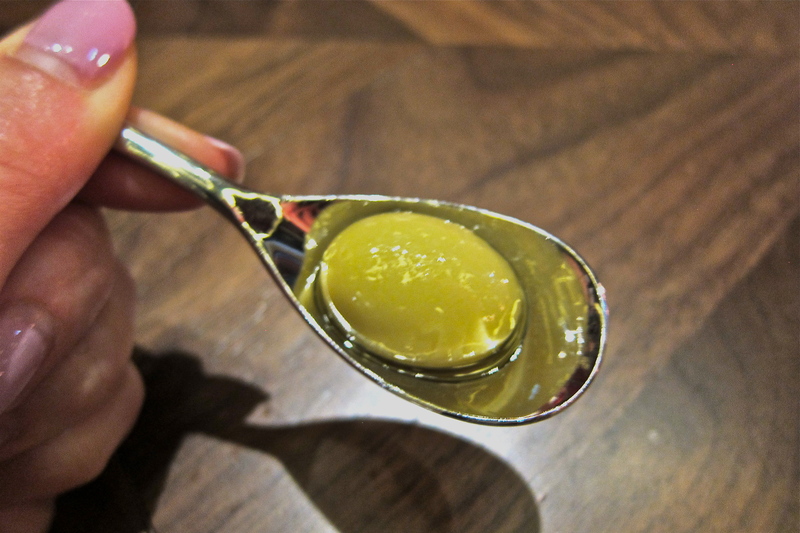 The result is olive juice that looks like an olive, is shaped like an olive, but bursts in your mouth upon the slightest pressure of your tongue. 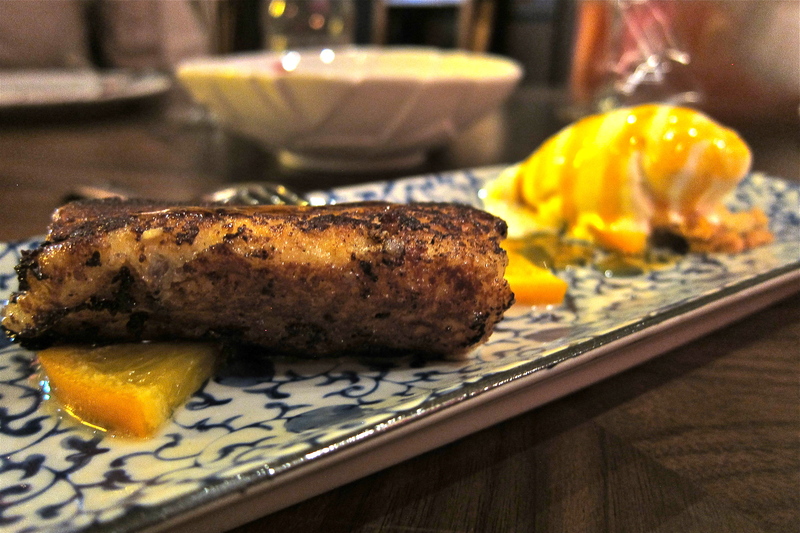 I haven’t had many experiences with molecular cuisine, and it is a curious thing to bite down on something that you think is one thing, but is in actuality, quite another. “Have them in one bite and watch out for the pit!” Many of Catalunya’s individual dish descriptions on the menu have these cute, tongue-in-cheek comments which I found quite amusing. It made reading the menu fun, and also entices you to order certain dishes that you may not have ordered, because sometimes the title itself doesn’t jump out at you. We were very generously given a few appetisers to start with while we were waiting, so I wasn’t exactly sure what they were, and whether they represent the regular portion size. All I can say is that this ham was incredible. 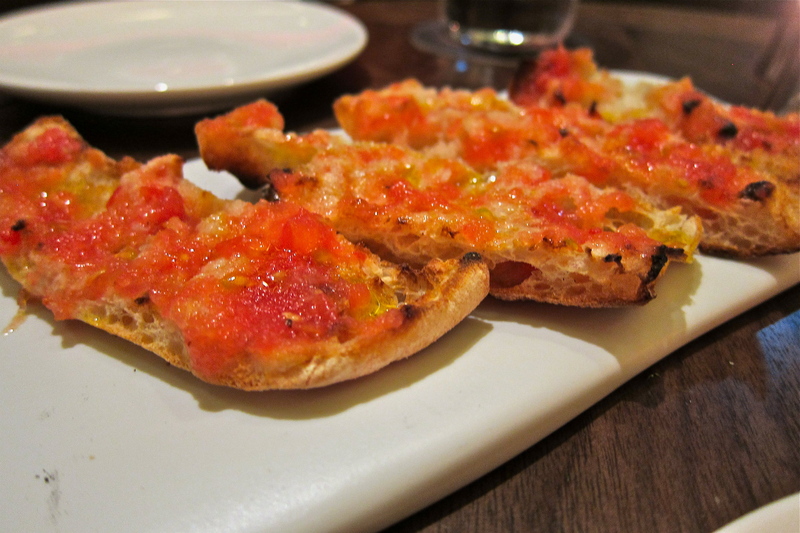 “Your first introduction to Tapas” the Pa Amb Tomaquet, or tomato bread, was a good start – a sweet tomato sauce, garlic scent and rustic bread. 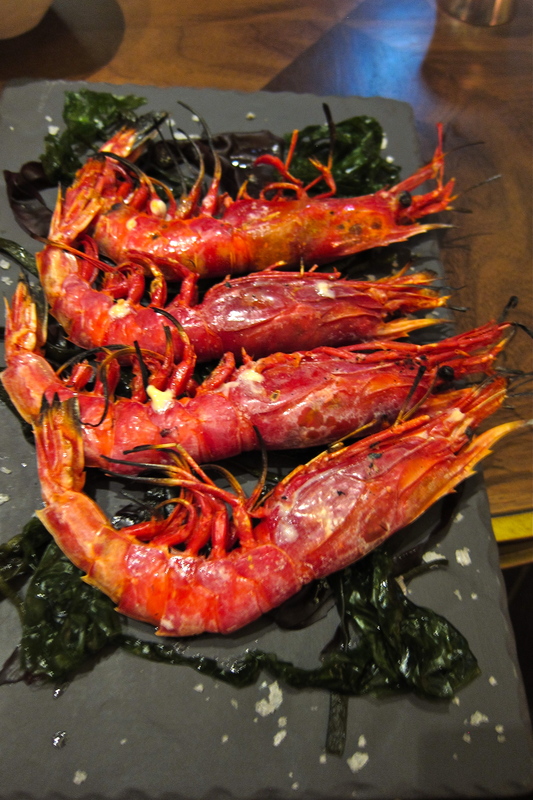 “You choose the style, we give the flavour.” Aaah the famed gamba roja. I say famed because I recently watched an episode of “Around the World in 80 Plates” where the contestants travel to Barcelona and cook with them – ever since I’ve wanted to try one. Ours were served grilled, and the flavour of the prawn was just incredible. I loved the richness of the prawn head juice … is there a proper name for that stuff? We were completely spoiled with this starter, and it was on this high that we were then seated at our table. “You’re not getting a swimsuit!” These little parcels of calorific goodness are not to be missed! 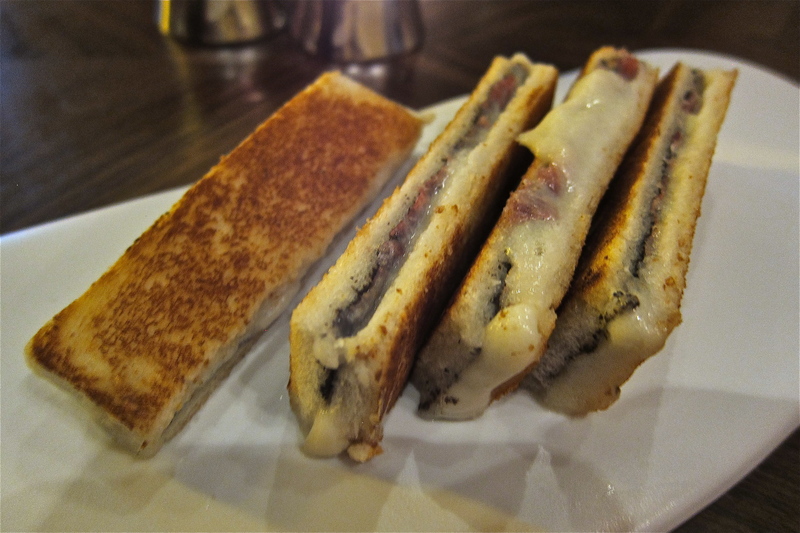 Truffle shavings, heaps of melted cheese and ham in between two pieces of pan-fried bread. As for why it’s called a bikini? Well, I’ve read that in Catalonia, the ‘bikini’ is a tapas bar staple – a Catalonian truffle, ham and cheese sandwich, if you will. When it’s cut into quarters diagonally, each piece resembles biniki bottoms! “For Herbivores” Well, vegetarians will be glad that there is at least one item on the menu dedicated to them, but it’s not the only veggie option. 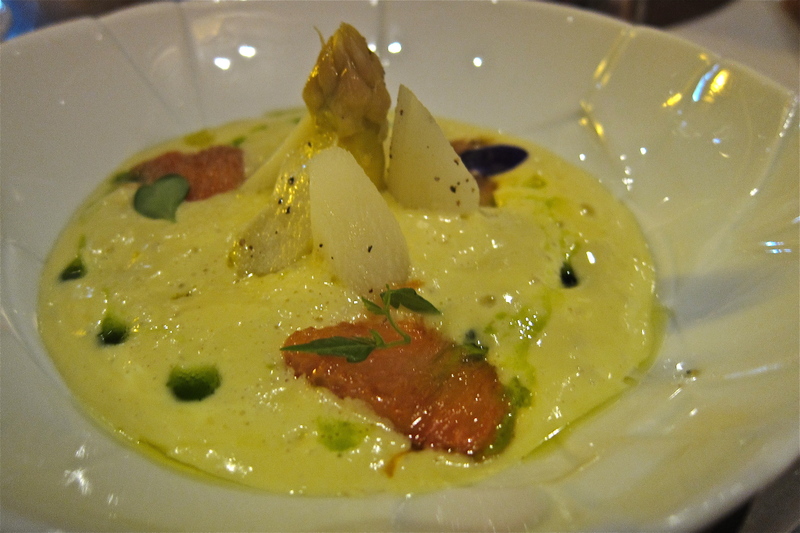 This white asparagus is tenderly steamed and swimming in a sea of tarragon mayonnaise. 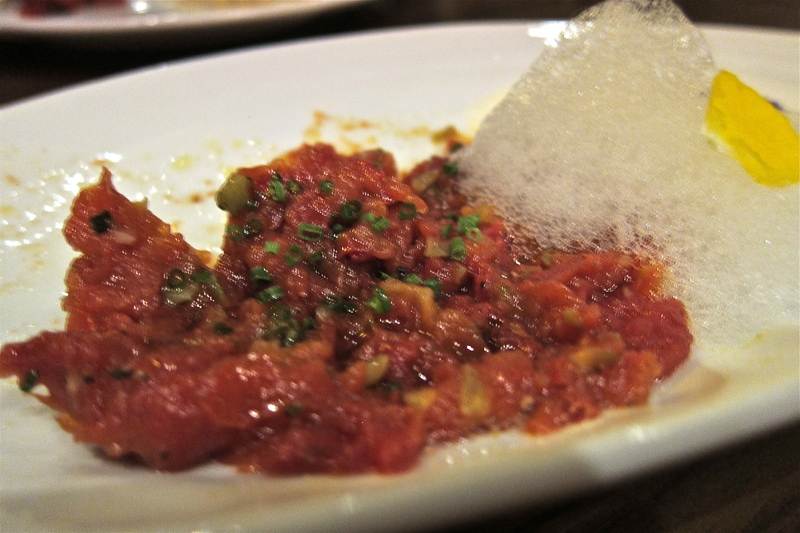 The sauce is airy, fluffy and great to scoop up with the thin bread crisps served with the tomato tartar, below. “This tartar has a trick up it’s sleeve” The trick is that it is surprisingly meaty! These sweet and substantial tomatoes are almost certainly imported and served with a foam – I don’t really understand foam. It doesn’t really do much for me. 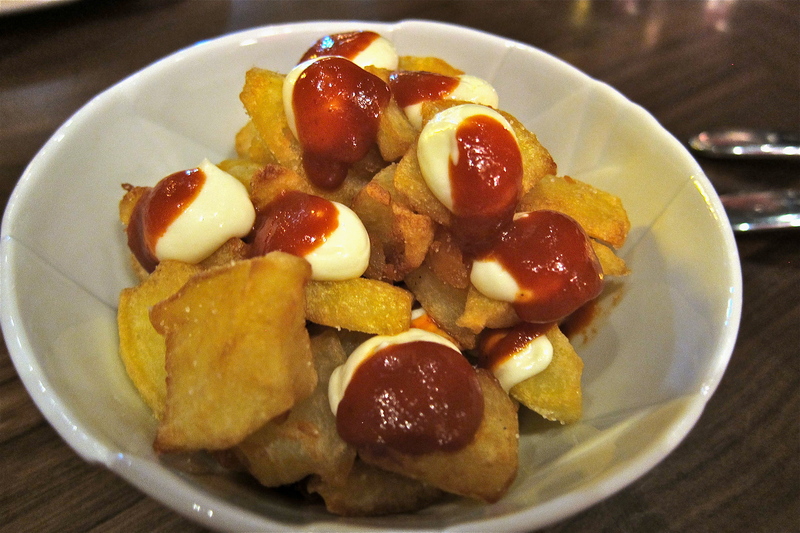 “Brave enough to try these fried potatos (sic)?” These are my most favorite patatas bravas yet, ultra crispy and served with small dollops of alioli and Brava spicy sauce, rather than completely doused in it. “A Cova Fumada creation” : Cova Fumada is an authentic family-run bodega in Barceloneta, which is said to be the birthplace of the spicy potato bomba. A meat and potato croquette of sorts, deep fried in bread crumbs and served with the aioli and Brava sauce. It was super yummy, but at this point, one starts to wonder if the meal is starting to get just a bit decadent. “The perfect example of lust in gastronomy” Oh come on, how can you not order this dish with a description like that??!! I have never had a tortilla like this one before. It is the tortilla of all tortillas. One tortilla to rule them all! Inside, it is lusciously creamy, with potato slices suspended in creamy egg, rather than just a solid block of well-cooked ingredients. You just have to try it. The only photo that I missed out on taking was that of the Avocado Lobster Roll (HK$160), my 2nd favorite tapa of the evening. A beautiful, fusioned dish of lobster wrapped in slivered slices of avocado and topped with ikura, or salmon roe. 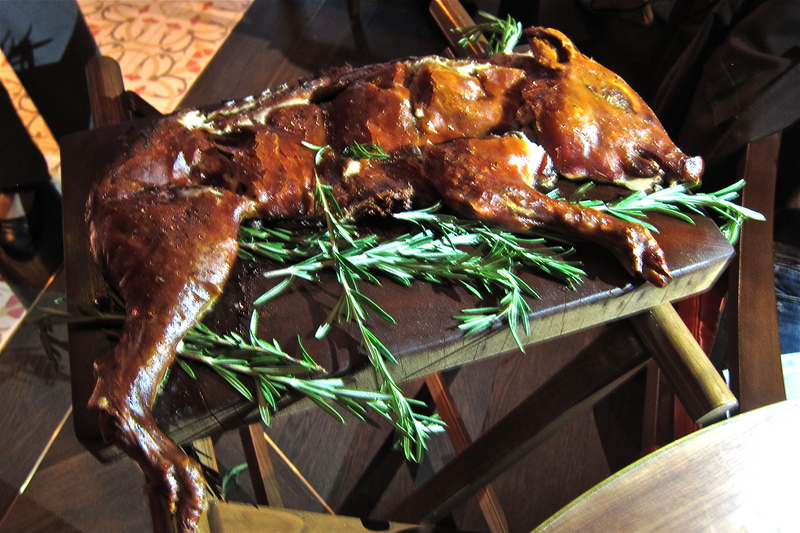 “Served in a special way” This little piggie definitely went to market, then was roasted in Segovian style. 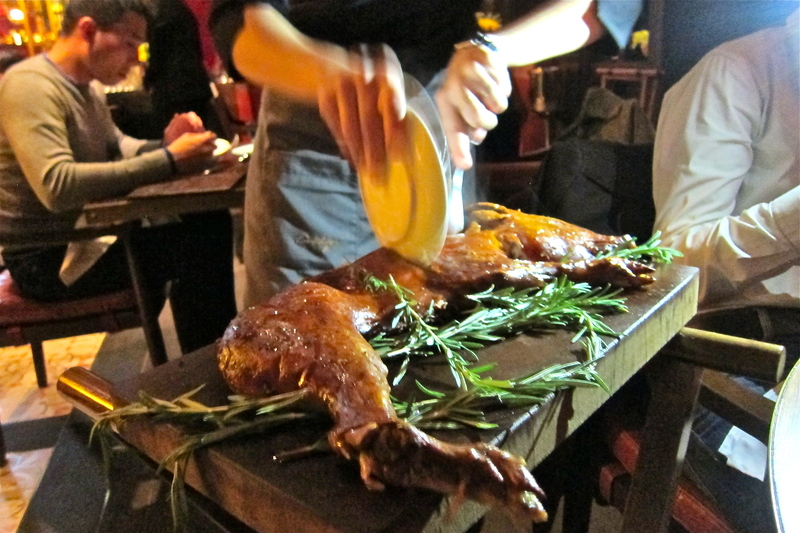 In Segovia, a city in the autonomous region of Castile and Leon in Spain, roasting pig is an art form. The piglet is traditionally roasted very simply with butter and seasoned salt, and is so tender that it can be carved with the edge of a plate, as it was demonstrated and served to us at Catalunya! 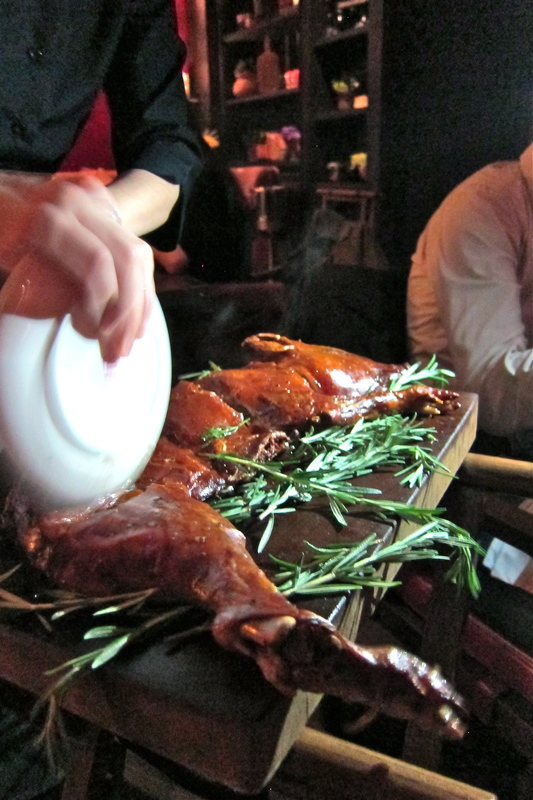 This dish is not for the squeamish, as head and trotters are served as well. The meat was incredibly tender, the skin deliciously crispy. There was a generous amount of meat, and after our starter round of tapas, there was plenty of piggie for the 4 of us – in fact, it could have fed at least one more. Although the traditional accompaniment to roast pork is apple sauce, this roasted pineapple was the perfect side dish – I think I’ll be serving pineapple with my roasts from now on too! 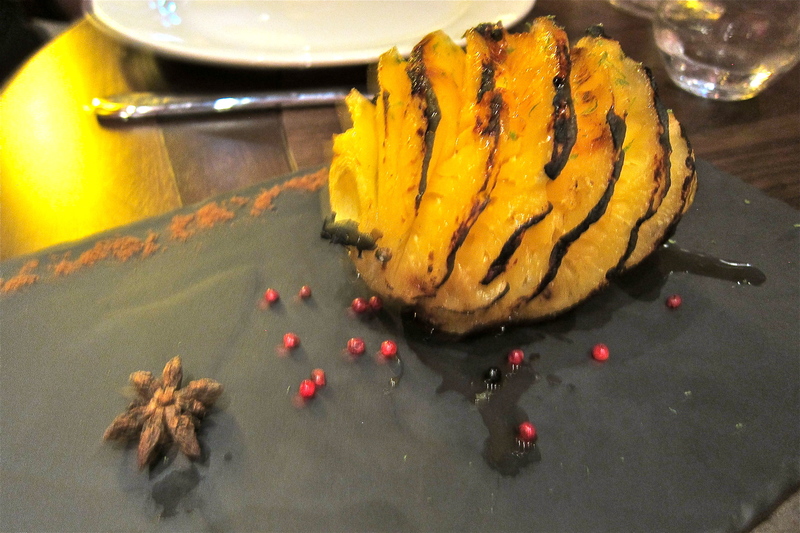 The fruit was cored, then spiced with cinnamon, as well as star anise and red pepper corns. 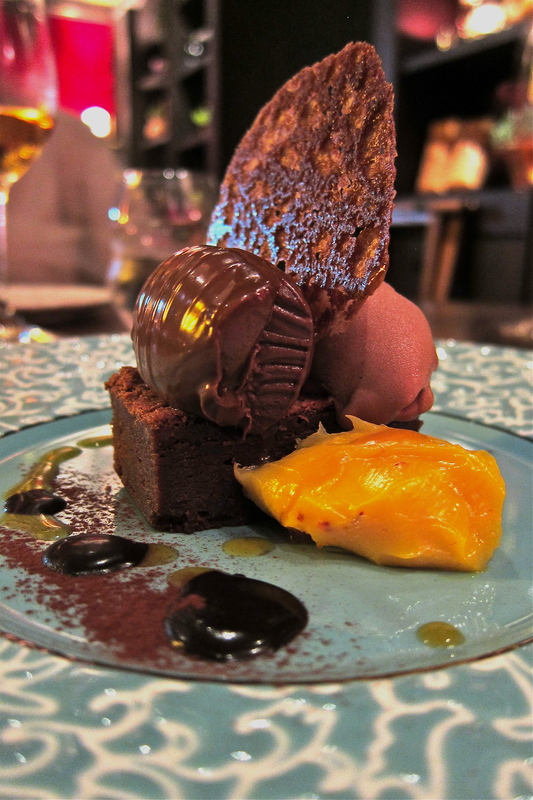 “A promise to end an indulgent meal on a delectably sweet note” I’m afraid we didn’t stop to ask what the trio of this dessert was in detail, but the smooth chocolate brownie, topped with two different ice creams, and served with a delectable passion fruit-y caramel-y butter hit the spot. “A twist on the traditional flan” This flan had an nice balance of sweet and savory, but not really my thing. And finally my favorite dessert, the torrija – the Spaniards answer to French toast, but better. It is bread soaked in milk and honey and then dipped in egg before being pan fried. 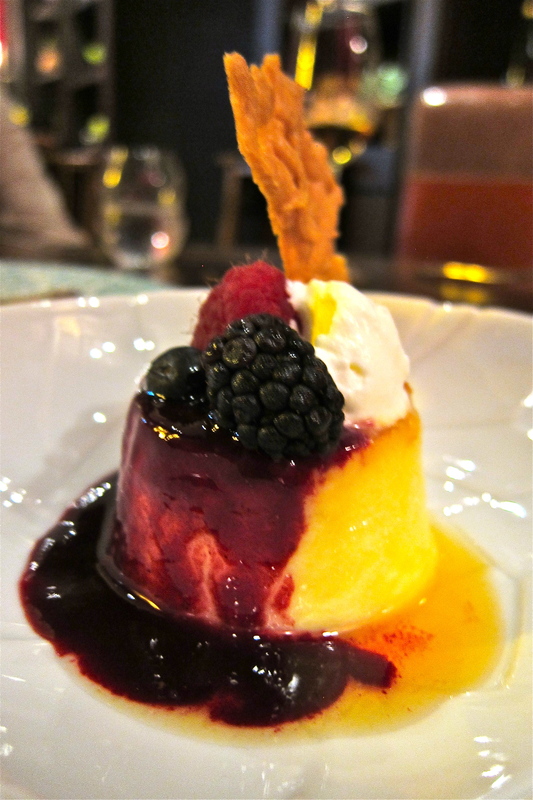 It was perfectly paired with orange and that amazing smoked milk ice cream. We finished of our desserts with a glass of Alta Alella Blanc de Neu (HK$90), a Spanish sweet wine that complemented the end of our gastronomic adventure through Catalonian cuisine very well. 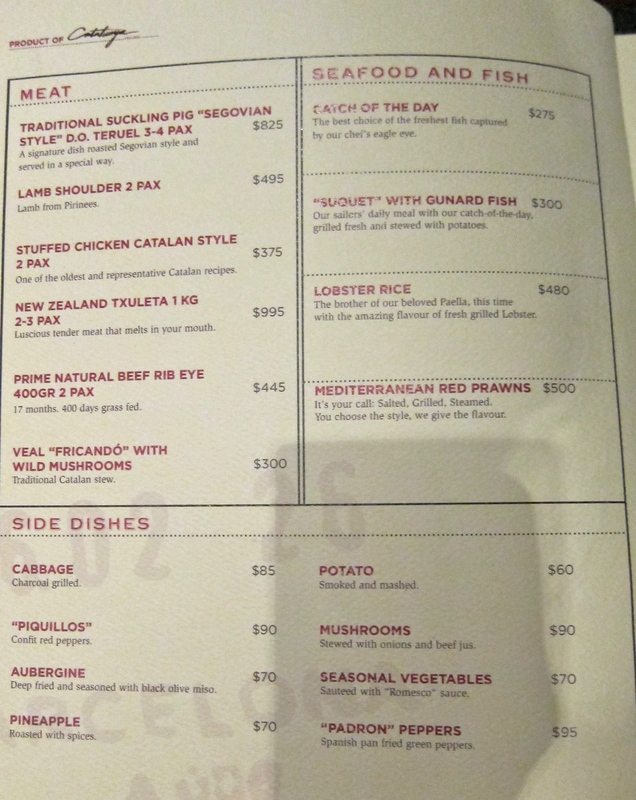 All in all, our meal came to around HK$1,000 a head, including a bottle of wine (approx. 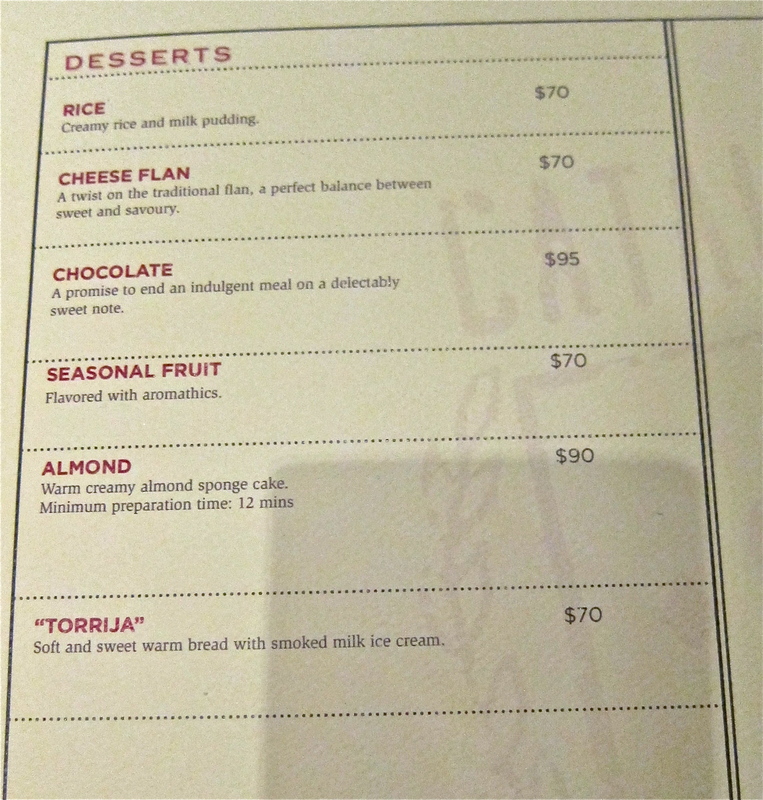 HK$700), but not including the appetizers in the Cocktail Lounge. It’s certainly towards the pricier end of the dinner spectrum, but it’s to be expected of an establishment such as this. And for the price, you are treated to some truly enjoyable, surprising, and authentic food. If you order strategically it can certainly be done for less. 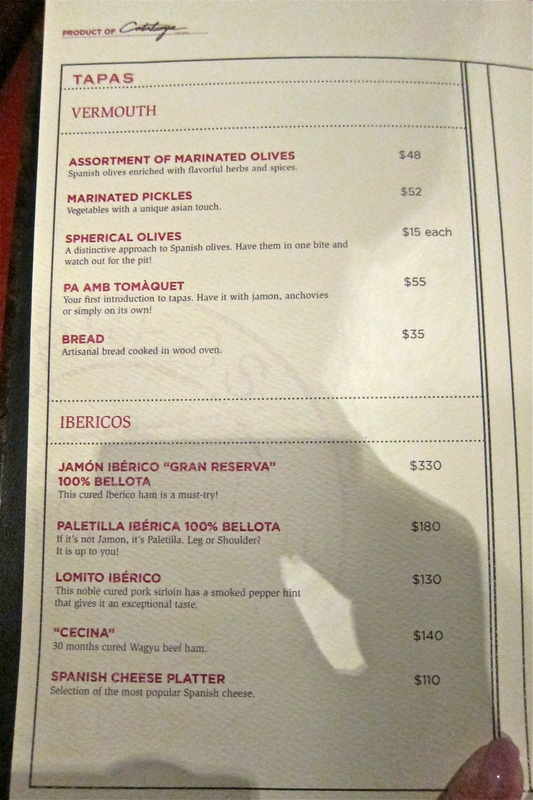 The menu is almost identical to the Cataluyna Singapore menu, with some additions. Why fix it if it ain’t broke, right? My only negative comment would be that the tapas were served much too quickly. We had all 6 served pretty much at the same time, so I felt like I had to rush through them all so I could enjoy them all hot. Apart from that, although I’m not going to be coming here weekly for a meal (it’s not exactly friendly to the hips! ), I would certainly return in the blink of an eye. Oh my goodness how did I not see that in my proofread! Thanks, and corrected! Having tried both Fofo and Catalunya, which one would you recommend more? Trying to decide on a place for xmas eve! Oh that is a tough question! I do love Fofo, their food is very homey and down to earth yet fresh and tasty. 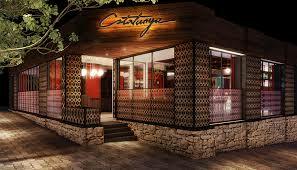 However, if you are looking for a special occasion meal such as xmas eve, then I would have to go with Cataluyna – it has more atmosphere, and the cocktails are amazing! I guess at the end of the day, if budget is not an issue, then I’d say Cataluyna all the way. Good luck with getting a table, I suggest you call them yesterday! Good luck! Wonderful! Enjoy, and happy holidays!